What it was like to be stat-tracked like Djokovic for a day. The shoes of a tennis player who remembered to bring his tennis shoes to a match. In other words, not the shoes of Carl Bialik. Based on my experience covering tennis, professional players usually remember to bring their tennis shoes to the court. On a June Thursday, as I walked into Courbevoie Sport Tennis outside of Paris, I realized I hadn’t. I was there to try out a new technology from Mojjo — a French company that makes what Emmanuel Witvoet, one of its founders, calls “Hawk-Eye for everyone.” Hawk-Eye is the advanced camera-based system that tennis tournaments use to adjudicate disputed line calls and to provide advanced stats for television. It’s sophisticated, impressive and expensive — out of reach for most amateurs, in part because it uses 10 cameras. Witvoet said he and his co-founders had figured out how to do much of what Hawk-Eye does with just one camera, making it affordable for the masses. Unlike the masses, pro players have ready access to the kind of data that Mojjo was about to provide me. They get all sorts of detailed stats after every match, and at tournaments like Wimbledon, they get more. After matches, they receive DVDs that allow them to toggle between points or watch only, say, their backhand errors. It’s not easy for amateurs like me to get that kind of information, but we are clamoring for it. Some 70 million fitness trackers like Fitbit were bought last year, and smart watches like Apple’s bundle fitness tracking with their smartphone features. In tennis, rackets from Babolat and racket attachments from Sony measure things like spin and speed of shot — but their accuracy is questionable. Now, for one surreal, amazing, frustrating and delusion-shattering morning, I would finally have the data. A camera would capture the flight of the ball, software would analyze what happened on each point, and detailed match stats — my detailed match stats — would be put online. I was treated like a pro, but the data showed me how far I had to go to play like one. My friend Alex Duff came along to help me test Mojjo out. Duff is a data geek and amateur tennis player who once recorded video of one of our matches so we could review our performance later. For this match, we were instead armed with two laptops — so that we could each predict the match stats beforehand. After telling the Mojjo courtside kiosk which of us was serving first, Duff and I took the court atop a light dusting of red clay, the same kind of stuff the pros would play on later that day at the French Open five miles away. I told Duff not to be too self-conscious even though a camera was running. I then proceeded to be incredibly self-conscious because a camera was running. I can’t remember starting another match as poorly as I did this one. My head was full of excuses, and I felt self-conscious every time a club employee walked on court, which was often: I felt his eyes staring at my shoes, as if he were the Mona Lisa. Mojjo was the main problem. I’d recently read the classic book “The Inner Game of Tennis” and knew I was supposed to think less and clear my mind. I didn’t — and instead was rushing during points. Silver lining: That meant we’d play more points in our allotted two hours, and more points meant more data. Despite my struggles, I won the first set 6-3. And after extending my winning streak to six straight games, I started to consider secondary goals, like looking good for the camera. I couldn’t do much about my sweat-stained shirt, but I could at least retuck my shorts pocket after pulling out a ball for a second serve. I promptly lost eight straight points. I started playing a little better and went up 5-3 in the second set. That’s when we played our best game of the match by far. We both hit winners and saved game points. After four deuces, I closed out the set. I asked for one more — and cruised to a 6-0 win. Then the email containing our stats arrived from Mojjo, and our amateur match suddenly felt like an official one. We had numbers that looked, if you squinted sideways, like numbers from the pros. We each had one ace. I hit four double-faults; he hit five. We each made a little over 50 percent of our first serves. These weren’t crazy numbers for a clay-court match by pros. Andy Murray and David Ferrer, two of the best players in the world, had just put up roughly similar numbers in their match at the French Open the day before. The video uploaded to Mojjo’s site later that day, and it was odd — not only because it depicted my awkward-looking one-handed backhand. At times, it showed scores that didn’t make much sense and seemed to include shots hit after rallies were over, like to get a ball back to the server, as part of the match. When I could get past the technical hiccups, I saw that unlike the emailed stats, which could have passed for professional-grade, the video looked nothing like match footage I was used to watching. Even with the unusual perspective of the single-camera wide shot, it was clear that my strokes weren’t Grand Slam-ready. And the tennis looked like it was being played at half-speed. Our bodies and the ball crept through the frame — even when the video wasn’t glitching. After matches, the founders compare the footage from the Mojjo camera to the stats and use any discrepancies to hone the system. On their to-do list: a voice-recognition system that detects when players call balls out; social sharing of points so you can, for example, brag about an ace on Facebook, with video; and a gamified system so coaches can set statistical targets — like hitting a higher percentage of service returns in the court — and players can collect badges for achieving them. They’re also considering a pure software version that will allow players to use Mojjo to analyze footage they’ve shot themselves. “Our idea is, in some future, you GoPro yourself, and it’s done,” Witvoet said. Because of the video problems, Witvoet agreed to share with me the raw video of the match. I decided to check the stats for myself. I used a system developed by Jeff Sackmann for his Match Charting Project, which has enlisted volunteers to chart nearly 1,000 pro matches. During my Eurostar trip from Paris back home to London, I alt-tabbed between the video and the spreadsheet to log every shot — its type, direction and outcome.1 Then I compared the results with Mojjo’s. They were off, in some cases by a lot. Duff hit 13 double-faults by my count, not the five Mojjo counted. I was making more first serves, but losing those points more often than Mojjo said. Both Duff and I were making more first-serve returns than estimated. And the break-point stats were way off for Mojjo, off even from the realm of possibility: The system showed that I’d faced five break points but been broken six times. (I counted four breaks off nine break points.) When Mojjo rolled out the next version of its software, correcting for problems reading high balls, and applied it to our match video, some but not all of these stats were more accurate — you can see just how accurate for my stats in the table adjacent to this paragraph. Chevalier estimated that the error rate on who won each point was below 5 percent. Score one for humanity over machine, so far at least, when it comes to logging tennis stats. But also score one for the pros, that special subset of humans who have someone doing the statkeeping for them. Mojjo isn’t the only tennis tracker around. An Israeli company named PlaySight uses four cameras to Mojjo’s one, and its technology is more mature: Clubs have already installed it in about 130 courts. It provides a glimpse of what Mojjo could eventually do and of how a more advanced system could do things for amateurs that even some pros don’t get. Over Skype, PlaySight’s CEO and co-founder, Chen M. Shachar, said his system cost $10,000 per court — about three times what Mojjo will charge — plus a license fee for each facility. As is the case with Mojjo, the club, not the player, pays the PlaySight fee. But clubs most likely pass this cost on to players through higher per-match prices. Shachar said PlaySight has much bigger plans. For instance, he said the software eventually will be able to compare, say, me to its database of other players and tell me how my serve, backhand and other shots compare with the averages. And he envisions an improvement on current systems for remote coaching, which require coaching companies to download and tag video: I could instead share my PlaySight account — including video and data — with a top coach on the other side of the world. That’s better than pros can do when they’re playing on courts without Hawk-Eye. PlaySight already can do things Mojjo doesn’t immediately plan on. For instance, PlaySight live-streams matches. And its courtside kiosks provide in-match stats and video replay. It also offers a level of precision that makes it possible to review line calls, which Mojjo doesn’t. While Mojjo lacks the precision to make line calls with certainty, its camera nonetheless gave me a rare chance to review my own calls. Pros don’t call their own lines, but amateurs like Duff and I do. And I could tell while watching the raw video of my match that I’d made some questionable out calls. That’s not the only lesson I learned from my experience with Mojjo. My serve and volley stinks — I won 25 percent of those points, and that was lucky. My backhand is much weaker than my forehand (43 percent on backhands without slice vs. 63 percent on forehands without slice). I also landed fewer first serves than I predicted I would — and that I thought I had right after the match. On the plus side, I learned that statistically, tennis looks pretty similar when played by two people of similar ability, no matter what that ability is. I even found a match that had roughly similar stats and scoreline to my match with Duff. It happened 15 years ago at Wimbledon. The winner was Fabrice Santoro, who like me had unconventional strokes.3 The loser was Andrea Gaudenzi, which sounds a little like Alex Duff in Italian.4 Pros: They’re just like us. I also came to a fairly obvious realization that nonetheless troubled me. Before my Mojjo match, I considered myself a smart player, adjusting my tactics to take advantage of each opponent’s weaknesses. 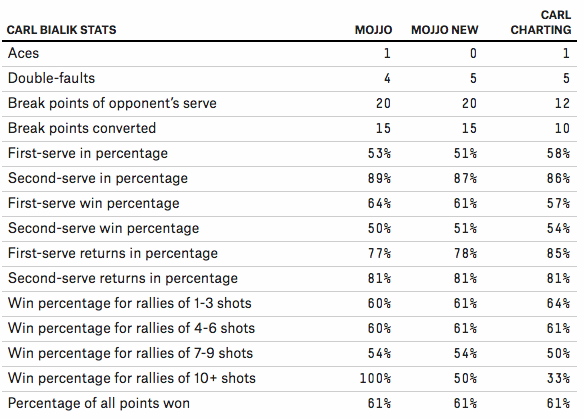 But with Mojjo, whatever I learned, my opponent would too — we’d both get the same stat sheets. For instance, from my charting, Duff landed 22 serves directed at my forehand and lost 20 of those points. If he notices that stat, he probably won’t serve to my forehand nearly so often the next time we play. Maybe having post-match stats would help my opponents more than me, by removing what I think is my tactical advantage from having an approximate handle on what’s working and what’s not. There’s also the risk I’d overthink things; even pros like Rafael Nadal and Novak Djokovic said in media conferences at Wimbledon this year that they don’t normally look at their own stats in too much detail. But even if data can’t improve my game, my curiosity is stronger than my competitiveness. Now that I’ve experienced what very few players have, it’s been hard to go back. Each match uncharted feels like a lost opportunity to learn more about my game — including just how ugly my backhand is. While I wait for Mojjo to fix its bugs and come to courts near me, I’m awfully tempted to start filming and charting my matches myself. Maybe I’ll use a GoPro. For example, for one long rally I lost, I entered 4f29b2f2f3b2b2f+1f1# into a cell in the spreadsheet. Pros, too, can have trouble tracking stats in their head. Gilles Simon, one of the most stat-conscious men on tour, said after defeating big-serving Milos Raonic at the Queen’s Club tournament in London last month that he’d thought Raonic had landed the vast majority of his first serves in the first set, only to learn when looking at the scoreboard between sets that Raonic had made just 52 percent. To find a similar match, I examined stats from 12,379 best-of-five-set matches made available on GitHub by Sackmann. Then I zeroed in on the 855 straight-set wins with scores closest to ours of 6-3, 6-3, 6-0. Finally, I calculated z-scores for 15 stats in our match and for each of the 12,379 pro matches: seven for each player (ace percentage, double-fault percentage, percentage of first serves that went in, percentage of first-serve points won, percentage of second-serve points won, break points against, and break points converted against), plus the dominance ratio (the ratio of the percentage of return points won to the percentage of serve points lost by the winner of the match). I summed the absolute value of the difference of the z-score for each of the 15 categories for our match and for each of the 855 matches. Santoro d. Gaudenzi came out the closest.